Have a question about the Mares Dragon MRS Abyss 22 Mission Puck 2 Package? Mares new Dragon Bladder design. Tightly tailored reducing drag, placing much of the air around the tank, contoured to greatly minimize the feel of the bladder underneath your arms, and creating comfortable surface flotation. With a lift of 20k/44lbs size lg. MRS Plus. Mares evolution of the 1st mechanical weight system introduced to the market. Incorporating a newly designed buckle system, one pull movement to release your weights. Shaped pockets to form to your waist. Trim Wts holding up to 4.5/10lbs total. Positioned in the lower part of the BCD for better upright efficiency at the surface, and a more streamlined profile. BPS Plus (Back Protection system) patented dual position lumbar capability. Heavily padded in either position, you can double the padding for increased lumbar support or extend the length of the padding depending on body shape. The regulator that beats every record, now even lighter. Our tradition for excellence keeps on evolving due to our new engineering and design. Abyss gained its reputation for reliability by setting many diving records, such as the deepsolo-dive to -313m and 101 divers breathing simultaneously for 40 min from a single MR22 first stage. All current in line Mares Regulators are compatible up to 40% Oxygen (EAN 40) right out of the box. Enjoy the versatility of Puck. This bag is large enough to hold regulator, gauges, and an octopus. 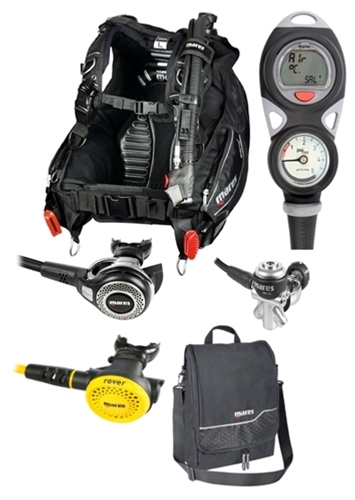 Keep your regulator protected but still have enough room to hold other accessories with this Regulator bag from Mares. Bag provides extra cushion and protection from the other items in your gear bag. Bag has a sturdy top grab carry handle and is made from durable PVC material throughout. Ample bag with shoulder strap and handle for arranging and protecting your regulator and accessories. I purchased this from OnlineScuba and have been very pleased with my experience. The products were exactly as described except and the condition of all pieces were perfect when I opened the box. Prior to purchasing, I did email OnlineScuba with a couple of questions and they were responded to within 24 hours. I am ver satisfied with my purchase and will plane on buying additional pieces from OnlineScuba. on 2/8/2014 I was considering buying your Mares Dragon package (http://www.onlinescuba.com/Mares-Dragon-MRS-Abyss-22-Reg-Instinct-Octo-Puck-Comp-Console-Package-P12283C147.aspx). My understanding is that the MR22 regulator needs a coldwater kit (I plan to use this off the B.C. coast). Is this available as part of the package? on 12/2/2015 I am interested in purchasing 2 of your "Mares Dragon MRS Size Large BCD Abyss 22 Mission Puck 2 Package". Would it be possible to switch out the Abyss 22 regulator for the Abyss 22 Nitrox regulator? if so, would there be a price difference? on 12/2/2015 Only Europe sells the Nitrox Abyss 22, but we are in luck as the Abyss 22 we sell with this package comes out of the box up to 40% nitrox ready. So, no need to worry!! Hope this helps.